Members of the Nigerian Union of Aviation Transport Employees (NUATE) have staged a two-day peaceful protest to protest inhuman treatment meted against some of their members during a protest they staged last week. The union last week protested the unlawful sacking of some of their members working at the Newrest Airline Services and Logistics PLC located at the international airport, Lagos. Some of the protesting members were however allegedly brutalized by the police which has led to another round of protests. 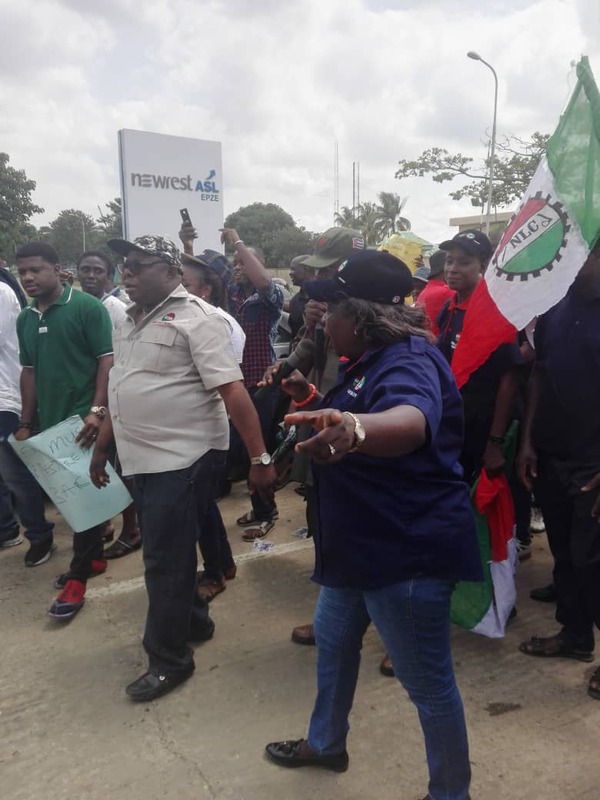 The unionists in collaboration with the Nigerian Labour Congress (NLC) and the Trade Union Congress (TUC) yesterday began a peaceful protest marching from the local airport to the international airport. One of the protesters, Comrade Tunde Yussuff during the protest said the members are protesting and picketed Caverton Helicopters and others who were maltreating their workers. “Caverton has been able to settle with our workers but we are out because they brought policemen to attack our members and took them somewhere at Oshodi,” he said. According to Yussuff, “Caverton sacked about 95 percent of their staffers and they refused to pay them off. They later agreed they would pay them by March ending, they have refused to pay. “During any struggle like this we always leave some people behind to monitor things while others are on the peaceful demonstration. They brought RRS men to attack those people we left behind. “In fact a lady lost her pregnancy in the process and a guy is still battling with one of his eyes due to the police brutality last week. It was the last week issue that brought this continued protest, the IG is already aware. We want those guys to be compensated,” he said. At the gate of the picketed Newrest Airline Services and Logistics PLC, the train had a break during which leaders of the protest addressed the convoy. Comrade Agnes Funmi, talking at the rally appreciated members who had turned out for the protest. She however lamented that the most unfortunate thing is that fellow Nigerians are used by foreign companies to terrorise their Nigerian workers. “Most of these inhuman activities are being perpetrated by our own brothers with the same skin color with us. They behave like lords but we are going to tell them they are only lords of the jungle. We are going to show them we are up to the task and we are ready to take up our responsibilities by fighting for our rights. “Nobody should drive us like slaves, NLC will not take anything less than the best for our members, that is why we have the NLC and TUC here in solidarity,” she said. First Trustee, Lagos State Council of National Union of Air Transport Employees (NUATE), Mr. Okenaiye Barnabas during the protest also said that the protest must continue in order to ensure compliance. “If the oppressors don’t have collaboration, they won’t be able to do the evil they are going against our people. That was why we too ran to NLC, for back up against injustice meted against our members. “That is why you see us here today. It is necessary that we unite against oppression; it is not a personal protest. If we must put an end to oppression we must all participate because we don’t know the next victim. We must prevent any future occurrence by sending this important signal,” he said. The unions however called for justice for their members alleged to have been sacked unjustly by Newrest Airline Services. The affected workers include Cashmir Anyanwu, Chris Ohonsi, Chinenye Nworka, Chris Opara. Newrest Airline Services and Logistics PLC was established in 1996 to provide catering and related services to airlines operating in Nigeria but the unionists have complained against the inhuman treatments meted against their workers who are union members.